The next farm walk will visit Marc Jones, a farmer who has turned the family's 500 acre tenanted farm from a standard mixed farm reliant on subsidies to a modern profitable system which can survive without them. 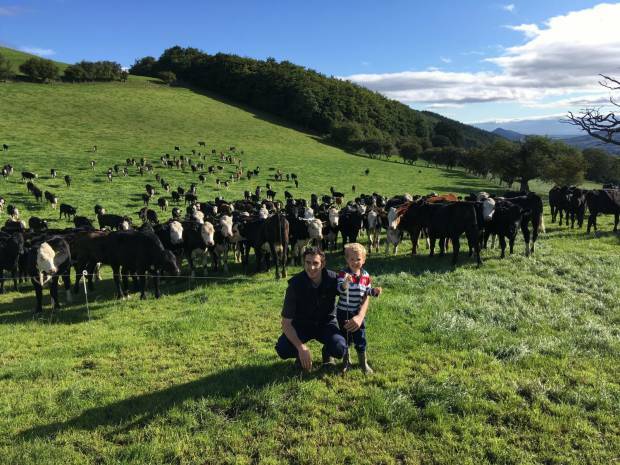 In 2009, Marc took part in the Hybu Cig Cymru Scholarship to New Zealand and came back with new ideas to improve the farms profitability. His aims were to improve utilisation of grass and forage crops on the farm to reduce the cost of production as well as maximising stocking rate and output. Fast forward 9 years. The sheep enterprise now consists of 800 Lleyn and Romney ewes which lamb outside and are outwintered on fodder beet. A further 450 calves a year are contract reared from 3 to 15 weeks of age for Dunbia. All calves are sourced from Co-op and Sainsbury’ dairy farms and are sold on to contract finishers. The farm has seen a massive turnaround in both output and profitability and now aims to produce 1 tonne of live weight per hectare as well as a profit which is three times the single farm payment. Speaking on the changes Marc stated, “Our priority is to utilise grass and forage crops to reduce our cost base, the out wintering of stock and paddock grazing has been a key component of this. We have developed the farm greatly over this period, with the majority of the farm being reseeded, tracks being installed and water and electric fencing infrastructure being put in place. This will hopefully put the farm in a good place with Brexit being on the horizon“.